Those who grew up in the eighties and nineties may recall a certain social dynamic that seemed to divide everyone between those who were cool and those who weren’t. The cool side of the dynamic was made up of all the pretty girls and all the boys who were physically active or socially adequate. If you were like me, you fell into the other side of the dynamic, those who were awkward, gangly, physically incompetent, and were interested in geeky things like superheroes, horror movies, technology, or the like. We were known as ‘nerds’ and we were picked on by the cool kids. 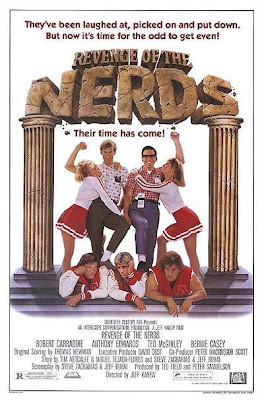 Those of us lucky enough to catch it on cable when our parents weren’t looking had a film to rally around back then that fulfilled our fantasies: 1984’s Revenge of the Nerds. Howdy folks and welcome to this month's edition of Film Faves. For those who may not know, Film Faves is a monthly feature here on The Gibson Review wherein I countdown my twelve favorites of any film-related topic. As I said, it is not an objective list of the twelve best of that topic, but a subjective favorites list - hence the name. Since its inception, Film Faves has been counting backward through time, knocking out my favorites of each year. This month, we hit the halfway mark of the 1990s with the year 1995. This month's subject was an interesting year for talent. 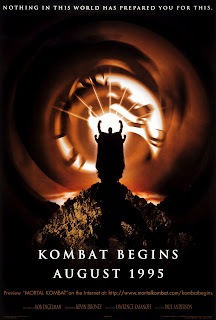 For example, it featured a heavy dose of debuts: Liv Tyler turned heads in Empire Records, Cindy Crawford turned people off in Fair Game, Natasha Henstridge turned geeks on in Species, Salma Hayek burned up the screen in Desperado, Jason Lee pissed Ben Affleck off in Mallrats, and Joaquin Phoenix tripped over himself for Nicole Kidman's attentions in To Die For. Over the past ten years we’ve seen a glut of superhero origin stories. These days it’s tougher to bring to the silver screen any hero who’s been in waiting in the wings all this time; you’ve got to keep it fresh and avoid hitting the well-tread tropes as plainly, otherwise the film becomes formulaic and fails to do the character justice. 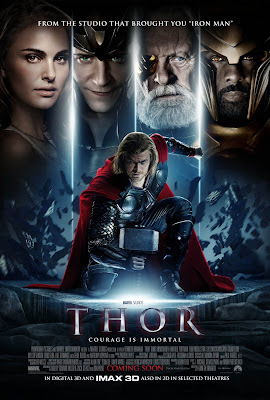 Marvel Studios has been experimenting with translating the cross-over (a staple of the comic book medium where characters and events from one property shows up in others) to a series of movies that would culminate in a film about a team of superheroes, Avengers. Iron Man and Incredible Hulk pulled it off to the delight of fans, mostly with scenes tacked-on after the credits. Iron Man 2 was the first to try integrating all the elements of its own plot with pieces of a greater puzzle – and nearly buckled under its weight. Ok, so I know summer doesn’t officially begin until June 21st, but according to Hollywood it begins in May and runs through August. Last year’s summer season was pretty much a washout, made tolerable only by a small handful of films (namely Inception and Toy Story 3). This year hasn’t had a great start, but here’s hoping for a better summer! Below is a brief rundown of some of the coming season’s approaching films, in order by release date with cast lists and trailers. 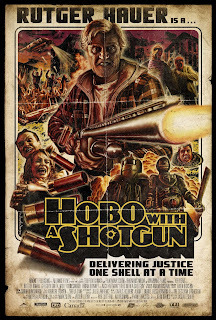 Hobo with a Shotgun – Starring Rutger Hauer. Directed by Jason Eisener (The Teeth Beneath).